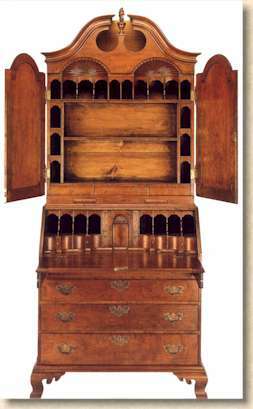 The Bonnet Top Secretary, or "desk with bookcase", features carved flame finial, raised panel tombstone doors and candle slides. The amphitheater interior displays stop fluted document drawers, a fan carved door, and a moulded deck. The lower case of graduated drawers is supported by scrolling ogee feet.